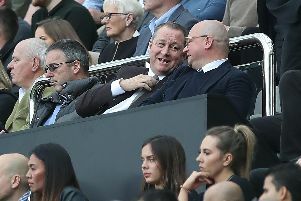 Ian Wright has backed pal Alan Shearer by lambasting Newcastle United owner Mike Ashley over his ownership of the club. The former Arsenal striker, who often features alongside Shearer as a pundit on Match of the Day, has laid into Ashley, believing he does nothing apart from 'take, take, take' and has heavily criticised him for not creating a community. Wright admitted he used to joke with Shearer about Newcastle but won't do so now as 'it isn't a joke anymore'. In a passionate rant when appearing on BBC 5Live’s Monday Night Club, the 54-year-old questioned 'where the money has gone' and is 'desperate' for someone to buy the club off the Sports Direct tycoon. “What Mike Ashley is doing to Newcastle is similar to what the Romans used to do to the Barbarians. Just come in somewhere and totally took it over," said Wright. “Don’t care about what is going on, what’s going on with the infrastructure, the people living there, just took over and do everything he wants. “All he has done at Newcastle - I speak to Al (Alan Shearer) all the time. “I don’t joke and mess around with him about it now because it is too close to the bone what is actually going on with Mike Ashley with his take, take, take. “You mention Liverpools and like what Manchester City have done, what Abramovich (at Chelsea) has done, they have built the community as well. “He (Mike Ashley) has done nothing for Newcastle or the area, or anything." Rafa Bentiez made over a £20million profit in the summer with the sales of Aleksandar Mitrovic, Matz Sels, Chancel Mbemba, Mikel Merino and Adam Armstrong. However, Benitez was only sanctioned just £23million to secure the permanent transfers of Martin Dubravka, Fabian Schar, Yoshinori Muto, and Federico Fernandez. That has left Wright questioning where the money has gone. He said: “The monies Newcastle have continually made from being in the Premier League, where is it? “One of the best managers in the world (Rafa Benitez), a man who is capable of doing a lot... where is that money? “What has happened to it? Why are there no players bought at Newcastle? “Why is there no infrastructure? What is he (Ashley) doing for the area of Newcastle? “What is he doing, what is Mike Ashley doing at Newcastle, apart from take, take, take? “Newcastle fans have been unbelievable with the patience they have got." It was reported by Sky News at the weekend that former Manchester United and Chelsea chief executive Peter Kenyon is interested in mounting a bid to try and prize Newcastle off Ashley. Wright is desperate for a potential takeover to materialise. “They are desperate for somebody to buy it. Peter Kenyon," he said. "You would hope he would come in and change stuff. “I just feel for Newcastle fans right now because it is not even a joke anymore."